June has been full-on. It generally is a busy month in the B&B. We also have a two week festival near our house, so there is plenty going on. My daughter had her karate grading this month and she is now a yellow belt, passing the exam with distinction. I am so very proud of her. She's finally found a sport where she excels. Her behaviour has improved too, so it has been wonderful for all of us. I also really loved attending Becky (Diary of a Fat Bottomed Girl) and Chris' renewal of vows with Lisa (HollyBobbs). It was such an emotional night and it was an absolute honour to be a part of their special day. I've really enjoyed June, and it also signals the halfway point of the busy B&B season, so I am officially on countdown to our holiday in October! 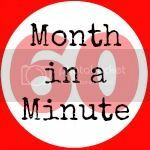 Here is my month in a minute.